When looking to build a shop in central Stockholm, unisex sneaker brand Eytys wanted a space that was just like the clothing on display: straightforward, no fuss, and functional—with just a touch of grit. 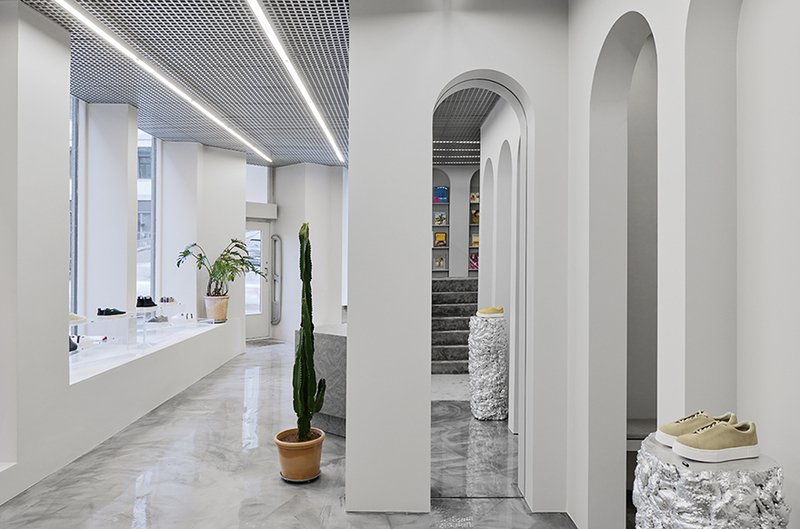 In-house architect Axel Wannberg translated that mission into a clean space filled with concrete and glass that was inspired by the work of Japanese designer Shiro Kuramata and Catalan sculptor Xavier Corbero. The built-in niches were among the architect's takeaways from a visit to Corbero's residence outside of Barcelona. "You can see [the influence] throughout the store," Wannberg says. "There's a heavy feeling through the grey colorway but with a ceratin lightness in shapes and details." The shoes were created in collaboration with South African artist Esther Mahlangu. The silver display module—made of insulation foam and chrome spray paint—is among the architect's favorite elements. "As we decided early on to focus on gray color tones, we needed to find materials with finishes that would add extra tension to the interior," Wannberg explains. The design team imagined the space as a way to extend the identity of the brand into the physical world. The project came with an unexpected surprise: the designers didn't get a real overview of the site until after demolition, which inspired some last-minute changes. "A retail space needs to combine inspiration and sales," Wannberg explains. "It must be inspiring enough for people to visit merely for the design but also sell products without screaming."